I'm so used to cooking my kale in the winter, that I forgot just how lovely a raw marinated kale salad can taste: a lightly tossed dressing wilts the leaves just-so, preserving their signature crunch but adding a vanishing, vinegary air to slightly soften each bite. It tasted so fresh and so right, I immediately set out to make my own marinated kale salad, settling on this Dinosaur Dill Crunch Salad with Salt & Vinegar Chickpeas. Of course, what immediately intrigued me was the salt & vinegar chickpeas. Angela describes these roasted legumes as tasting just like salt & vinegar chips, "minus the deep frying and unhealthy ingredients." Sold! Although a bit time consuming from start to end (but very little prep time), they are so crispy and delicious I would definitely make these plain to just eat as a snack. The vinegar contrasts beautifully to the earthy tones of the kale. But I didn't just stop at kale. Determined to make this the ultimate green salad, I added spinach leaves, cucumbers, and shredded zucchini to my (largest) mixing bowl. You're going to want as many ingredients as you can find to soak up this amazing dill tahini dressing! Light, flavorful and refreshing, the tahini adds a delicate creaminess to the sprightly vinaigrette. It encompasses every fresh flavor in preparation for spring. The intricate layers of flavor in this salad make it a robust option for a main meal. Earthy crunchy vegetables, velvety tahini dressing, and the little chickpea crisps—almost like popcorn—promise a taste and texture variety that definitely won't leave you bored, as some salads can do. Also, this salad is so aesthetically beautiful with its mix of green hues, purple onions, and rich brown garbanzos that you can't help but be enthralled. For a little extra protein I added hard-boiled egg to my salad too. I omitted the sesame seeds only because I didn't have any, but I think any crunchy seed, like pumpkin or sunflower, would work nicely too. My other edits to the original recipe are below. 1. Salt and vinegar chickpeas: Preheat oven to 425F and line baking sheet. In a pot, bring 2 cups white vinegar to a boil and add pinch of salt. Add in drained and rinsed chickpeas and bring to a boil for 1 minute (no longer). 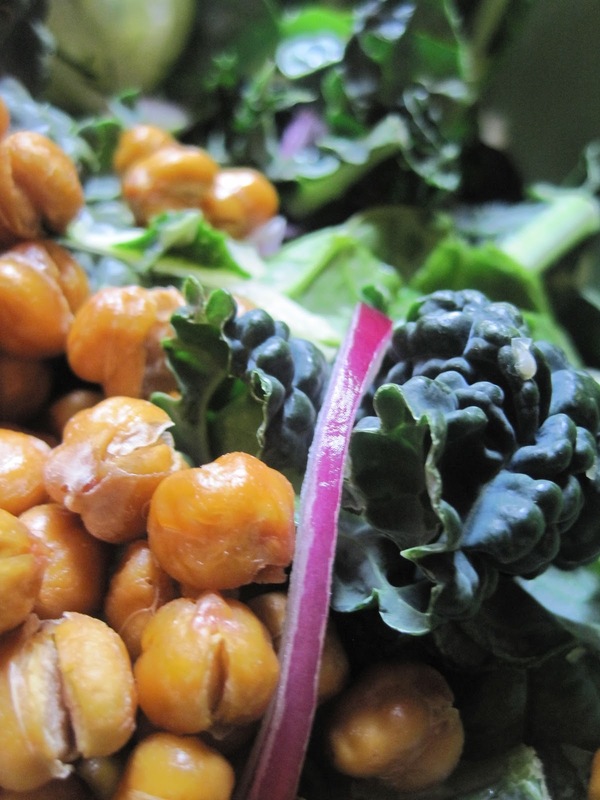 Turn off heat and let the chickpeas sit in the vinegar for 30 minutes. Drain the chickpeas, place into pot, and light coat with a tiny bit of oil (optional) and a few sprinkles of kosher salt. Place on pan and roast for 35-40 minutes at 425F, until golden and crispy. Halfway through baking, give the pan a shake to rotate the peas. Keep an eye on them to avoid burning. Leave on pan until ready to eat. They are best served fresh as they get soft when stored. 2. Dill dressing: In a mini chopper or food processor, mince the garlic. Now add in the rest of the ingredients, except for the dill, and process until smooth. Give the dill a rough chop and add into processor and process until smooth. Should keep in an air-tight container for 5-8 days in the fridge. 3. Salad: Prep all salad ingredients and add into a large bowl. Massage your desired amount of the dressing into the leaves and let it “marinate” until ready to serve. 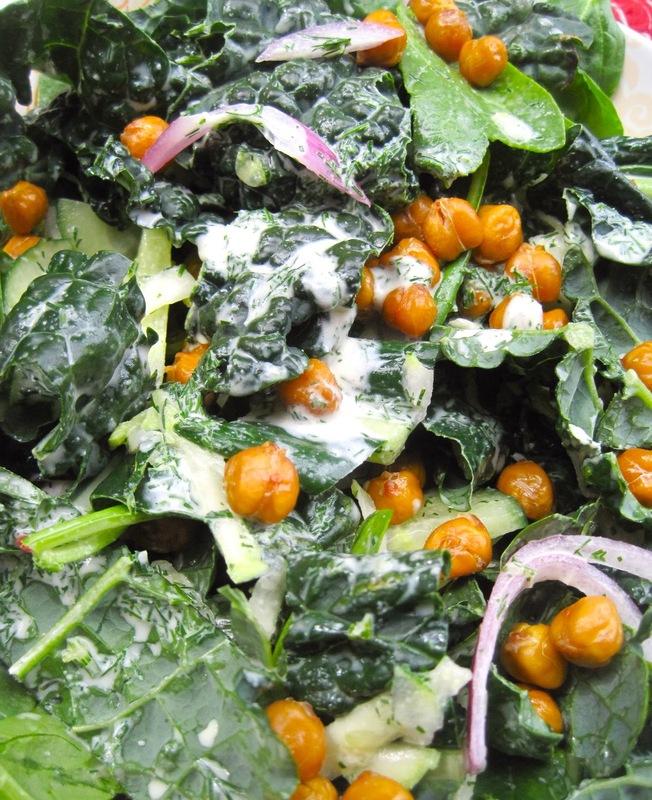 Add roasted chickpeas on top along with a drizzle of more dressing and sesame seeds.